Roxy T. had the misfortune of ending up in a southern California animal shelter from which very dogs get adopted. But Roxy was a lucky one. She was noticed by east coast volunteers from the Miracle GSD Network and they swung into action. 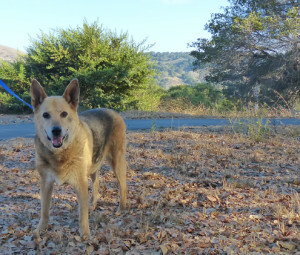 At their urging, their colleagues in southern California evaluated Roxy, tested her with dogs and a cat, and found a wonderful, gentle, affectionate German Shepherd that just wants to be snuggled and taken for some interesting walks. The southern California volunteers, even took videos of her and sent them to us at the Thulani Program. We were really excited by what we saw and were told, and agreed to bring her into the Thulani Program. At which point, money was raised for her medical needs and temporary boarding while we worked out a way to get her to the Bay area. Hey, southern California, look where I get to live. When she arrived safely in Aromas, here is what we found. 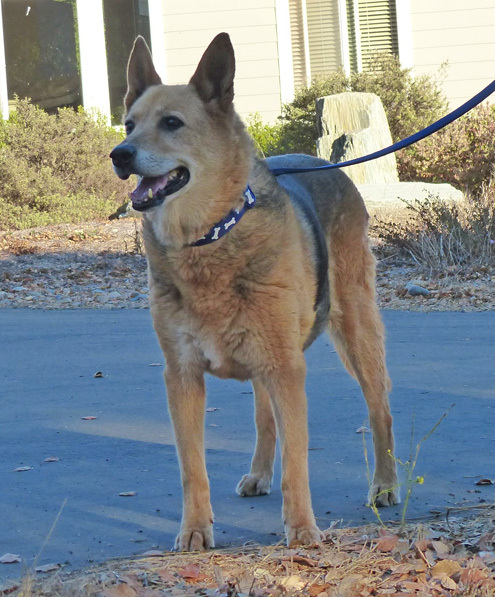 Roxy T. is a small female German Shepherd that was picked up as a stray. The shelter estimated her age at 14 years, but she does not look like she is that old, and she definitely does not act that old. We guess her at 10-11 years. 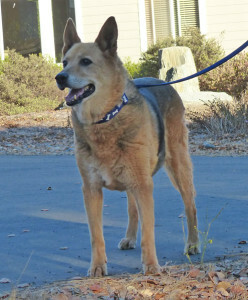 She is an easy-going dog that loves her walks. She is good with dogs, big and small, and even ignored a cat that strolled by her in the shelter. She is very affectionate with people, loving pets and contact. She appears to be house-trained and knows how to use a dog door. So thanks to dedicated people all over the country, Roxy T. has a new lease on life, and will live out her days in love, warmth, and comfort. Thanks Miracle GSD Network—you do good work. This entry was posted by ravikravik on August 16, 2014 at 8:44 pm, and is filed under Recent News. Follow any responses to this post through RSS 2.0. You can leave a response or trackback from your own site. I share a house with an older lady and her very loving black GS mix, “Lovey” who is 10-11 yrs old. She is not an alpha, loves all people and dogs, large and small and is non aggressive towards cats. She is a gentle giant! I had a 60 lb. Female, lab mix that I had rescued when she was four. 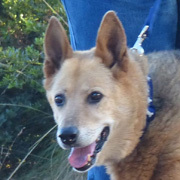 I had to put her to sleep 2 weeks ago at 17 yrs., of age and am looking for another older dog to rescue and give a calm and loving life. “Lovey” would also like another dog as a companion. Please let me know if I can help.